Speaking as a retired detective, I was astounded that your lament over the murder rate did not mention the massive role that drug prohibition plays in the carnage (“Choosing Chicago’s murder toll; Defy the odds; Push the body count lower in 2014 and beyond,” Editorial, Dec. 29). Per experts testifying in the U.S. House, gang violence would be cut in half if the gangs had no drugs to sell. You do your readers a disservice not mentioning the biggest driver of felony crime in Chicago. Below is a RARE (conservative blog & radio) 4.5M report on COP efforts to spread the word on the NAACP endorsement…either read the transcript or listen to the radio interview… either way, your support for COP is making an impact. The nation’s oldest civil rights organization, the National Association for the Advancement of Colored People (NAACP), wants “swift enactment” of a Republican proposal to nullify federal drug laws. 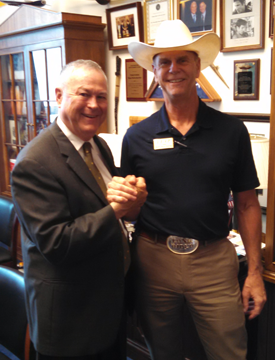 Rep. Dana Rohrabacher’s (R-Calif.) “Respect State Marijuana Laws Act of 2013” would protect marijuana users from federal prosecution in states where the drug is permitted for medical or recreational use. 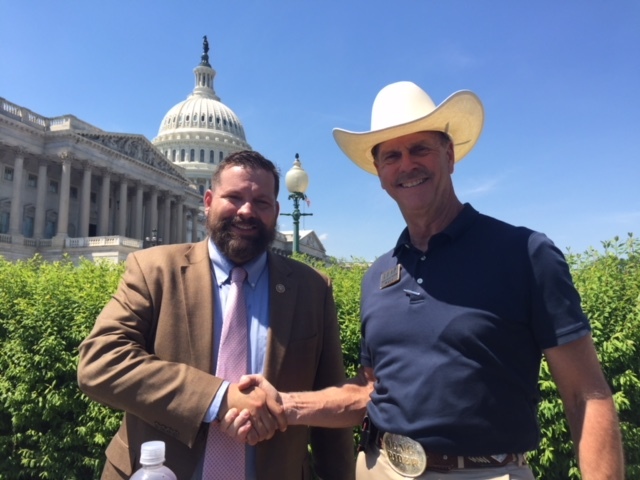 The bill has bipartisan support — 20 co-sponsors as of Wednesday — including tea party associated Republicans like Reps. Justin Amash (R-Mich.), Don Young (R-Ak. ), Dan Benishek (R-Mich.) and Steve Stockman (R-Texas). The NAACP’s support might seem curious for an organization perhaps best known for battling “separate but equal” Jim Crow laws that were prevalent in Southern states until the 1960’s. Today, the organization sees states’ tolerant of marijuana use as more humane toward minorities than federal law, particularly “mandatory minimum” drug sentencing laws that have done disproportionate harm to minorities. Some have called mandatory minimum sentencing laws the “new Jim Crow” including Howard Woolridge, co-founder of Law Enforcement Against Prohibition (LEAP). “The great evil in America has been drug prohibition and now the NAACP is working on this issue also. I expect much greater collaboration going forward, now that we are on the same page,” Woolridge told Rare in an email. If the NAACP’s firm states’ rights position represents realignment in American politics, a similar shift may be happening within the GOP. Not only have some of the most conservative Republicans in the House supported Rohrabacher’s bill, but other liberals have taken notice that the most outspoken member of Congress on the issue of drug law reform is a Republican. 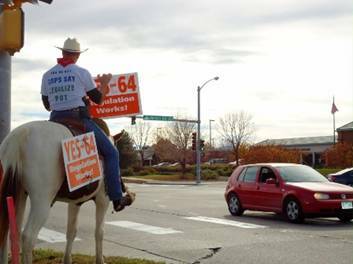 Howard “Cowboy” Wooldridge, a retired police detective, demonstrates Friday in favor of Amendment 64 at Platte Avenue and Main Street in Fort Morgan. 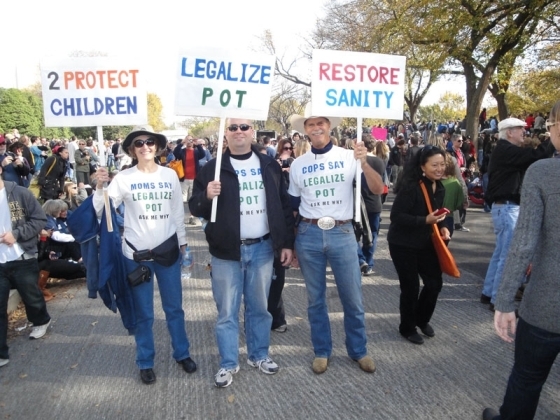 (Picasa) People in law enforcement have better things to do than chase petty offenders with small amounts of marijuana. 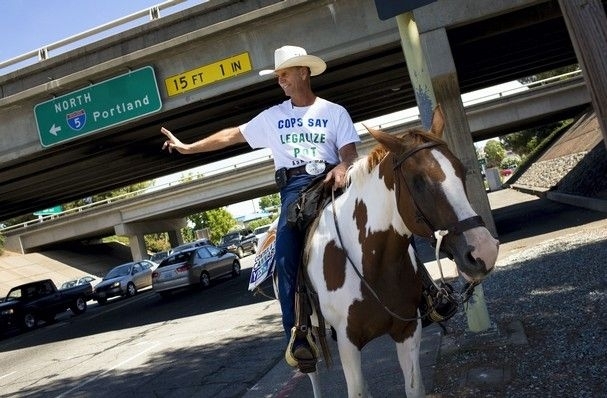 So says retired police detective and lobbyist Howard “Cowboy” Wooldridge, who spent some time Friday on a downtown Fort Morgan street corner on horseback with a sign urging support of Amendment 64, which would legalize and regulate small amounts of marijuana in Colorado. “We (law enforcement) need to focus our attention on pedophiles and other serious threats and not waste our time on the green plants,” he declares. The percentage of traffic stops that result in marijuana arrests is low, he said, and the number of deaths in Mexico in enforcment battles is high. 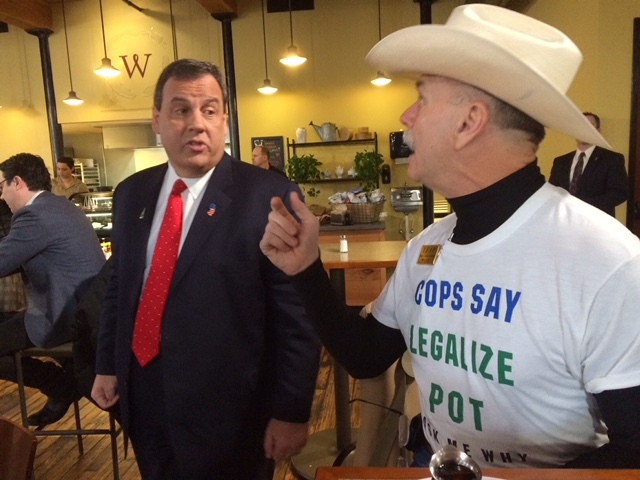 Marijuana should, he says, be regulated like alcohol and subject to the same common-sense regulations. Wooldridge was taking a break from his fulltime work as a lobbyist in Washington, D.C. in opposition to drug prohibition. He retired as a detective near Lansing, Mich. After 12 years on the street, moving first to Texas in a position in international customer relations — he speaks English, French, German and Spanish.